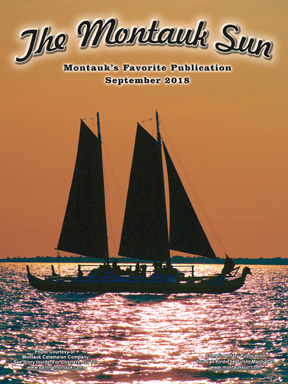 The Montauk Sun would like to thank The Montauk Catamaran Company for supplying this month’s cover photo. Pictured is the Mon Tiki Largo. The Montauk Catamaran Company is a family owned business that builds, owns and operates the fleet of Mon Tiki catamarans. 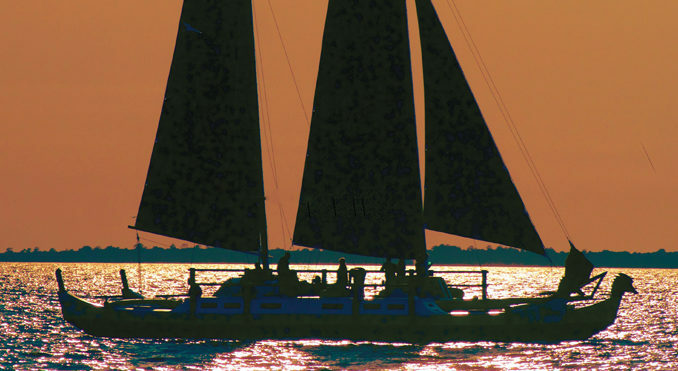 They offer both group walk-on ticketed sailing outings and private charters daily from mid-May to early October, sailing out of Gurney’s Yacht Club at 32 Star Island Rd. 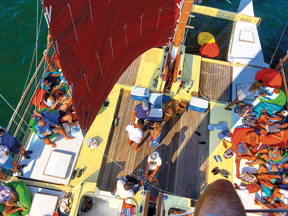 Mon Tiki and Mon Tiki Largo are open bridge deck catamarans based on traditional Polynesian designs. The spacious and flexible open deck plan offers plenty of room for passengers to stretch out and relax. They are fully licensed and insured with professional and experienced captains and crew. Their original boat, Mon Tiki, is 40’x21’ with about 500 square feet of open deck, and is US Coast Guard certified for up to 49 passengers. Their flagship vessel, Mon Tiki Largo, is 63’x30’ with about 1500 square feet of US Coast Guard approved passenger carrying deck space and a passenger rating of up to 100 passengers. The newest member of the Mon Tiki catamaran family is Mon Tiki Mini, a 26’x15’ launching in 2018 for small group charters of up to 6 passengers. The sailing trips are out and back sailing excursions through the harbor and Sound, taking best advantage of the conditions of the day – exactly what the sail plan is will depend on temperature, wind, and sea conditions, as well as the make up of the group – the Captain will confer with you about this before departure. On a day outing in summer, some of their trips make an anchor stop for swimming or water sports (paddle boards & other toys are included.) They also offer sunset cruises. Whether you’re looking for a fun family activity, a romantic date idea, or a unique and ideal platform for a special event, they will help you plan it. Mon Tiki Catamarans are locally built from the keel up by Captain David Ryan and a team of Long Island craftsmen, using low-impact construction methods. The original Mon Tiki’s hulls were constructed in a potato barn in Bridgehampton, NY in 2011, while Mon Tiki Largo’s larger hulls took over 3 bays of an industrial park in Holbrook before being transported to Montauk for final finishing work and launching in 2016. Both boats are constructed in accordance with the Code of Federal Regulations under US Coast Guard supervision, and to their exacting Inspected Passenger Vessel standards. Every phase of construction, from initial design, to hull construction, to rigging and deck layout have undergone rigorous US Coast Guard review and certification. Only USCG Inspected Passenger Vessels are permitted by law to carry more than six passengers, and Mon Tiki Charters are the only sailing vessels operating full-time in Montauk that meet this exacting standard for design and safety. For more information and ticket sales visit them online at montikimontauk.com or give them a call at 631-668-2826.